Also in 2019, various performers will be taking the stage at the now fourth Carinthian Theatre Festival. Six different theatre groups from Carinthia will be presenting their plays to the stage – children’s theatre, comedy, drama, crime – on two days, there will be a diverse, entertaining program. Additionally, the participants can also take part in a workshop. All amateur theater groups and children’s theatre groups can enter. The productions will be selected by a jury according to genre, festival suitability and quality. Further criteria for entry of the participating play are a duration of no longer than 80 minutes as well as no need for a break or a too sophisticated stage scenery. Springtime! The season of powerful awakening and life. A big wonder and miracle every year! A magical beginning, just like a first note from the silence. Following the footsteps of the family Berg at their summer refuge at Lake Ossiach, we feel the same magic: Spring is in the air, surrounded by breathtaking nature and the inspiration of Alban Berg’s spirit of discovery. We want to be enchanted, embark on a new journey and listen to the quiet sounds in the silence of nature. The composer that has bestowed a unique efflorescence upon Romanticism and also pushed open the door to Modernism will be our companion in these days. Only bookable for schools! Well, that’s what Prince Tamino and bird catcher Papageno would also like to know! But how can you help them? By pulling the strings yourself, of course! At the exciting puppet theater with Lisa Pippan, which brings Mozart’s famous opera “The Magic Flute” right to the CMA. Two school classes can participate at every theater performance. So, sign up right away and dive into the mysterious soundscape of the famous composer… A prince who faints during the escape from a snake? 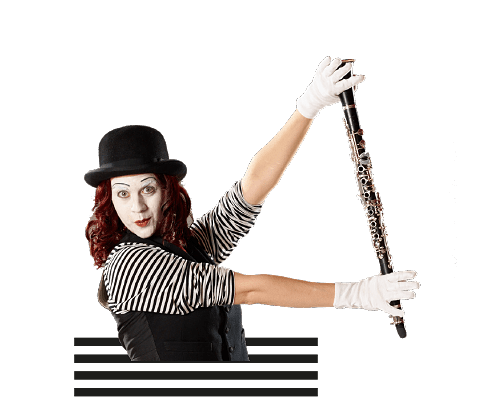 Papageno, the funny bird catcher, tells the story of how he met Prince Tamino, who is the Queen of the Night and why he and the Prince need to start looking for Pamina. Wild animals also appear on their journey and in the end, Tamino and Pamina must succeed in the dangerous fire and water tests. The story will be developed in narrative form and together with the children, who will take on the parts of the animals, help Papageno and accompany Tamino and Pamina on their tests. Moreover, children will learn the special playing technique with puppets as well as other techniques used in puppet theater. In the end, they can also try playing with a puppet by themselves. The performance is targeted at children from age 6-10. For all young visitors we offer a free open-air public viewing. Enjoy the concert live on a huge screen. While the musicians of the Baltic Sea Philharmonic orchestra enjoy a well-deserved break, you can enjoy our big highlight: the show of the “dancing horses”. Horse and equestrian present themselves in perfect harmony and make the evening unforgettable. The show is open for premium as well as public viewing ticket-owners. The participants of the flute summer course 2019 present their skills on stage. With the opening concert "Night of Percussion" the Austrian Percussion Camp starts, where great musicians and lecturers will be guests in the CMA Ossiach to teach Snare Drum, Mallets, Cajon, Frame Drum, Handpan, Drumset, Bodypercussion, Drumline, Songwriting and Choir. At the opening concerts the lecturers will introduct you into the world of percussion. STUDIO PERCUSSION Graz Phone: +43 664 5242252 www.studiopercussion.com Further information available from March 15th. The 25 young musicians of the Venezuela Brass Ensemble take you on a musical journey throughout America. The orchestra is conducted by Thomas Clamor. They are playing argentinian tangos, brasilian samba, mexican Rancheras and many more. Dates and program subject to change. The brass ensemble of the Berlin Philharmonics consists of 12 musicians who are playing mainly on German instruments. Byrd: The Earle of Oxford’s March (arr. : Elgar Howarth) Bach: Drei Bach Choräle (Enrique Crespo) Dowland: Book of songs (arr. : Olaf Ott) Bruckner: Ave Maria (arr. : Hans Peter Gaiswinkler) Purcell: Suite from ”The Fairy Queen” (arr. : Eric Crees) Shostakovich: Jazz Suite no. 2 (arr. : Mogens Andresen/Daniel Drage) Mahler: Urlicht (arr. : B. Mansted) Elgar: Chason de Matin (arr. : Harvey) Aieta/Piazolla/Villoldo: South American Tango Suite (arr. : Joshua Davies) Dates and program subject to change. The Septura Brass Septet consists of the best young brass musicians of all England. The ensemble was founded by Simon Cox, who was present in many well-known british orchestras as a solist. Dates and program subject to change. The Ensemble Pro Brass consists of 15 highly talented austrian musicians who have been playing for many high-class orchestras in Europe. With a passion for details the orchestra is presenting the new program: "OHNE TITEL - Carte Blanche" which is about to become a huge success. Dates and program subject to change. The Carinthian Brass Band consists mainly of brass and drum teachers of the "Kärntner Landesmusikschulwerk" together with some music students. The Carinthian Brass Band was founded in 2007 by Robert Hofer, member of the Austrian Brass Quintett HoViHoLoHoff. From the beginning on, the band was successful and became part of the first Carinthian Brass Season in the CMA in 2009. In 2019, the Carinthian Brass Band is lead by Tristan Uth fort the fourth time. Philip Sparke: Concert Prelude Gustav T. Holst: Ode to Death Anton Bruckner: Locus Iste Eric Whitaker: Lux Aurumque Ola Gjeili: Tundra Tristan Uth: Paradise William Rimmer: Slaidburn Marsch Joaquín Rodrigo: Concierto de Aranjuez Franz von Suppé: Ouvertüre zu Leichte Kavallerie Franz von Suppé: Ouvertüre zu Dichter und Bauer Gioachino Rossini: Ouvertüre zu Wilhelm Tell Dates and program subject to change. Attention, children! Who says that Saint Nicholas always arrives with his sleigh? At the children's advent in Ossiach Saint Nicholas brings his presents by boat! So put on your warmest coat and greet Saint Nicholas with a loud "Ahooooooooy! ".